Parental controls are all the rage these days, as moms and dads everywhere fight the good fight to keep their kids safe, ensure they are exposed only to appropriate content — and, of course, keep their devices clean and functional. There’s a lot of information out there about these straight-forward types of restriction functionalities, but there are also some unconventional ways to restrict access to web content to protect your systems as well as the people — young and old alike —who use them. Restricting Internet access for users, particularly teens, isn’t just about content — it’s about data. Users with metered Internet connections or data restrictions on mobile devices should think long and hard about who uses their systems, and how. To prevent unwanted downloading of large files that could, when done too much, inflate your monthly bill or slow your service deliver, think about restricting or blocking access to sites that enable massive music and video downloads. There are many straight-forward types of restriction functionalities, but there are also some unconventional ways to restrict access to web content to protect your systems as well as the people who use them. Parental controls aren’t just about restricting access to certain content, but limiting the actual amount of time kids can spend online and/or with their devices. Amazon isn’t alone in this, but one of the great features of the new Kindle Fire HD is FreeTime, an app that lets parents set time limits based on the type of content their children are viewing and to edit those preferences to tailored specifically to each user profile, i.e. each child. 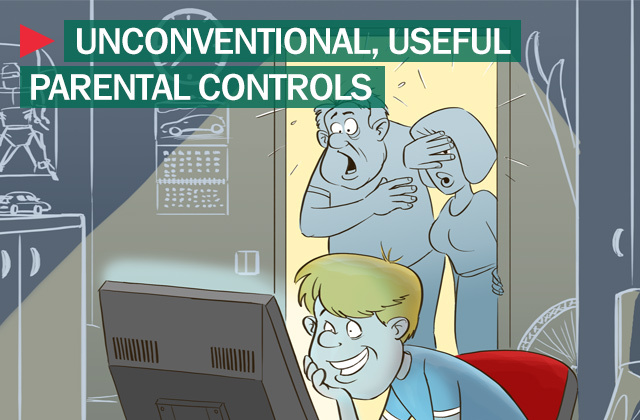 Parental controls aren’t just targeted at kids anymore. Elderly users may get confused sometimes by all of the programs offered on an operating system, but you can help them by setting up controls for their user accounts that limit the programs that they have access to, reducing the possibility that they will be confused by an application they inadvertently launch. Of course, you can limit the programs that seniors run, but you’re probably not preventing them from going online — and that’s where a lot of damage can happen. But today’s controls can help steer seniors clear of confusing and harmful sites where they could unwittingly download unwanted programs, or launch system software that will only confuse them. Utilizing the anti-banner feature in Kaspersky Internet Security 2013 can eliminate useless popups that will only confuse seniors with unneeded and potentially malicious content. Ultimately, the surest way to protect your system and to manage how users operate your systems and devices is by diligently setting up and monitoring your operating system and web browser profiles — and by protecting your systems with robust security programs like Kaspersky Internet Security 2013, which creates fine-grained web controls, and system security suites like Kaspersky PURE 3.0, which is there to protect your system for the inevitable times that parental controls are skirted, inadvertently or otherwise.